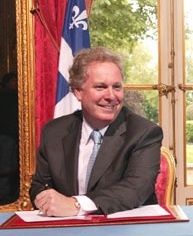 Jean Charest was the Liberal Premier of Québec from 2003 to 2012. After gaining power in 2003, Charest's Liberals were re-elected in 2007 and 2008, but lost to the separatist Parti Quebecois in the 2012 election. Formerly, Charest was the leader of the Progressive Conservative Party of Canada from 1993 to 1995. This was after the party's caucus was reduced to only two seats in the House of Commons after the 1993 federal election. This page was last modified on 11 December 2018, at 11:25.